Looking for a payment method to fund your online casino account offering the safety of a web wallet but with less of the hassle? 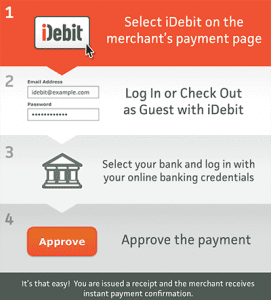 Consider using iDebit, an online payment service which allows you to transfer real money directly via your Internet banking account – and it’s no longer just available to Canadians. iDebit is a safe online payment method allowing you to make purchases or fund your online casino account directly via online banking. It works in a similar fashion to a web wallet, but unlike traditional web wallets like Skrill or Neteller where you need to sign up for an additional account and transfer funds to your e-Wallet, iDebit requires no pre-registration and you can even use this service as a guest. You don’t need to adds any funds to your iDebit account, as transactions are processed directly through your bank provider. Given its ease of use and the extra layer of security it provides, iDebit payments are accepted at many of the best online casinos and are becoming increasingly popular with players who are tired of re-entering their credit card details across multiple casino sites. You must be at least 18 years of age and have access to an Internet banking account to use iDebit. If you don’t have online banking, you can contact your financial institution to set this up. You will be required to enter your date of birth upon signing up to confirm you are of the legal age requirement. How to make a casino deposit using iDebit? Making an online casino deposit using iDebit is easy, and if you’re familiar with online banking this process will be a breeze. All you need to do is find a safe online casino accepting deposits using iDebit (Jackpot City Casino, All Slots and BGO Casino are our top-rated casinos supporting iDebit payments) and sign up for an account with the casino. When you’re ready to make your first real money deposit, head to the casino’s banking/cashier section and click to select iDebit as your chosen payment method. You’ll be prompted to enter your online banking details and the amount of money you wish to transfer, and once you’ve completed your transaction the funds will be available immediately. You are now free to start placing real money bets on the slots, blackjack, roulette, video poker or any other casino game of your choosing. iDebit can be used to withdraw winnings from your online casino account to your online bank account, but this is only supported by certain countries and iDebit withdrawals are only offered by some online casinos. If the casino you’re playing at does allow iDebit withdrawals, you will need to process your withdrawal request as per usual, which may take a few business days to process. If it’s your first time withdrawing funds via iDebit, you will also need to log in to your iDebit account and add your bank account details to the ‘Withdraw Funds’ section. Once approved, funds withdrawn using iDebit can take up to five days to process. Is iDebit only available in Canada? iDebit used to only service the Canadian market, but this payment service has since expanded and can now be used by players in a wide variety of countries (provided iDebit payments are supported by your bank). If iDebit isn’t supported in your country, it could be based on the online gambling laws. For more information about the online gambling laws applying to you, refer to our international online gambling laws guide. Australia, Austria, Belgium, Canada, Estonia, Finland, France, Germany, Great Britain, Hong Kong, Hungary, Italy, Japan, Latvia, Lithuania, Netherlands, New Zealand, Poland, Portugal, Slovakia, South Africa, Spain, Sweden. For a full list of the countries and banks serviced, you can refer to the FAQ section on the official iDebit website. Choose your country from the drop-down menu and you’ll be given details of all your local financial institutions which work with iDebit accounts. $/€/ £1.00 if using AUD, EUR or GBP. Withdrawing funds from your iDebit account to your bank account will cost you 2.00 CAD, AUD, USD, EUR, GBP or AUD. All payments made in currencies other than CAD, USD, EUR, GBP or AUD will be subject to currency conversion fees, subject to the exchange rates current on the date the transaction occurs. The currency conversion fees charged by iDebit also include a premium to compensate for the currency risk involved in providing this service. While these transaction fees will be a turn-off for some players, we think this is pretty reasonable for the quick service and high level of security provided by the iDebit payment service. Are iDebit casino payments safe? Along with convenience, safety is the main appeal to using iDebit for online casino transactions. As payments are processed via your Internet banking account, you’ll be protected by the same high level of digital security used by your bank merchant, along with the minimum of 128-Bit SSL security used by all of our recommended online casinos. iDebit does not store any of the personal banking information you enter or reveal your banking information to the casino vendor, so you can rest assured your iDebit deposits are safe. For a full list of the top-rated casino sites accepting players from your country, refer to our casino table at the top of this page which has been geo-targeted to recognise your location. If iDebit payments are not available to players you’re your country, choose from other trusted casino payment methods like Visa, MasterCard, Neteller, Skrill, Paysafecard, Flexepin, Entropay and others.